Welcome to Mentor for Bank Exams. 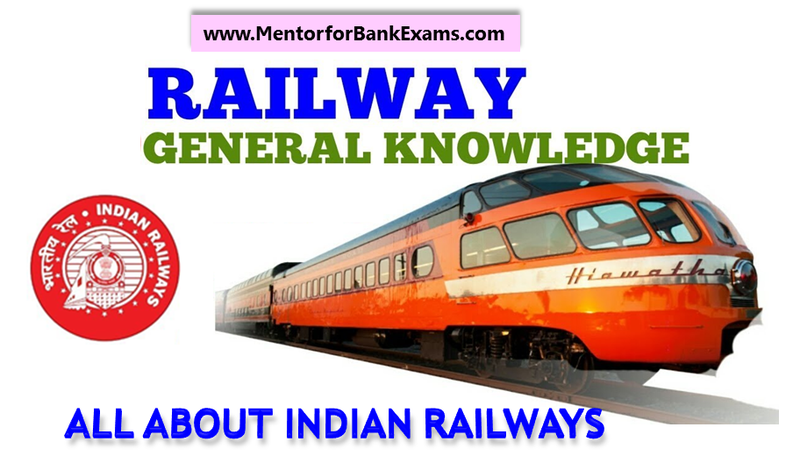 Here we today providing the 25 questions of Indian Railways previous examinations Q.A with there answers. 1) Which Zone is the largest railway zone in India? 2) When was the first underground railway (Metro Railway) started in India? 3) Which is the following pairs of regional Railways and their headquarters not true? 4) When the Shatabdi Express train was started in India? 5) The headquarters of South-Central Railways is situated at where? 6) At which of the following places Diesel Component Works is established? 7) Diesel Locomotive Works is situated at where in the India? 8) A platform surrounded by rail lines from all the four sides, is called what? 9) When was the nationalization of Indian Railways done? 10) In which year Research, Design and Standard organization was established in India? 11) Which railway station situated in the extreme south India? 13) Where is the Research, Design and Standard Organisation situated? 14) Between which of the destinations the first Indian train was started? 15) Where is the headquarters of Central Railway situated? 16) A station where the rail lines end, is called? 17) What is the length of North-Eastern Frontier Railway (NEFR)? 18) The headquarters of North-Eastern railway is situated at where? 19) What is the position of the Indian Railway under the zonal system? 20) When was the North-Eastern frontier Railway (NEFR) established? 21) Where is the headquarters of North -Eastern Frontier Railway (NEFR)? 22) How much distance was traveled by first train of India? 23) In which of the following cities, the first sub-way train was started? 24) General Manger is responsible for? 25) The headquarters of Northern Railway is at?